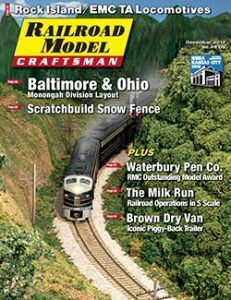 While showcasing craftsmanship, teaching skills, and informing the hobbyist with regard to the world of model railroading are among primary goals, Railroad Model Craftsman has another important mission to share with its readers too – the desire to grow our great hobby. One of the best methods of accomplishing this important objective has always been to reach out to the youth of our society and introduce them to model railroading through the gift of a train set – a holiday time tradition some families have passed down over several generations. Although there are many starter sets in a variety of scale sizes on the market these days, Lionel, in particular, has been a brand name associated with this American Yuletide practice for well over a century now and its O-gauge 3-rail starter sets still meet the holiday season in full force. As such, it seems appropriate that the December installment of “Test Track” takes a look at just how today’s Lionel, through a combination of quality traditional toy trains paired with the technology our tech savvy youth so crave, is helping to expand the ranks of model railroaders. 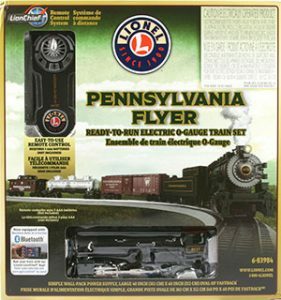 For 2017, the “Pennsylvania Flyer” LionChief 0-8-0 set leads the way among Lionel’s new Bluetooth equipped consists. The ready-to-run set, which retails for $299.99, arrives in a rather compact, for O gauge that is, almost cube shaped box the provides the novice with a sound-equipped steam locomotive, rolling stock, oval of track, power supply, and LionChief handheld remote – nothing else is required for the novice to begin their journey into model railroading. Fabricated in China, the set components are covered by the manufacturer’s “bumper-to-bumper” one-year warranty. From the get-go, the new range of Lionel starter sets entices the novice with wireless remote control operation, digital sound, and animation through the locomotive’s operating exhaust and lighting system. 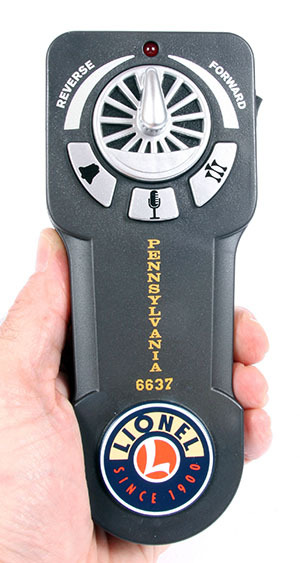 The LionChief system, which communicates at a 2.4-gigahertz radio frequency between the operator and locomotive, utilizes a handheld remote that provides throttle and direction control, plus activation on demand of the horn/whistle, bell, and “announcements” sounds. If this were not enough to garner a budding model railroader’s attention, Lionel is now incorporating Bluetooth technology into all of its LionChief sets too, whereby anyone with a smartphone can download the free LionChief App and have even greater control over their burgeoning railway empire while using the familiar touchscreen technology. Let’s take a closer look at this set beginning with the locomotive. The Pennsylvania Flyer is headed up by an eight-coupled steam locomotive that is based on a United States Railroad Administration (USRA) 0-8-0 design and teamed up with a “clear view” (recessed fuel bunker sides) tender. Typical of Lionel steamers, the engine’s shell is die-cast metal, as is its frame; while the tender body is formed from durable plastic and fastened to a stamped-metal floor. Being of relatively recent design, the tooling of this duo displays mostly molded-in, but crisp details that are further enhanced on the locomotive with separately applied bell, whistle, and pop valves, steam dynamo, headlight, compound air pump, and hand-painted crew figures seated in the cab. Its metal drivers, although not see-through, do display the facsimile of spokes and counterweights and its running gear is represented by stamped-metal connecting and coupling rods with simplified valve gear. The tender, in turn, exhibits cast-on steps at each corner, a simulated coal load, add-on back-up headlight (non-functioning), and rides atop a pair of plastic four-wheel trucks with metal wheel sets. A truck-mounted operating knuckle coupler can be found on the rear of the tender, while the engine features a plastic dummy knuckle coupler mounted on its pilot. Finally, uniting the two is a rather ingenious drawbar design that acts as both the mechanical and electrical connection with the locomotive’s male component easily plugged into the female receptacle on the tender via a firm downward push. Surprising for a starter set, the authentic decoration of the locomotive and tender is a real boon for Pennsy fans. Lionel has actually followed the Pennsylvania Railroad motive power department’s 1929 edict of having the boiler, cab, and tender painted Dark Green Locomotive Enamel with black underside, Front End paint applied to the smokebox, firebox, and ash pan areas, and Freight Car Color used on the top of the tender cistern and the steel cab roof between the gutters. The duo is finished out with sharp gold lettering and stripping with the cab number, 6637, reflecting an actual Pennsy C-1 class 0-8-0. Keeping with the Pennsy theme, the rolling stock reflects similar attributes. Each member of the three-piece consist features injection-molded carbodies, plastic trucks, metal wheel sets, and truck-mounted operating knuckle couplers on both car ends. 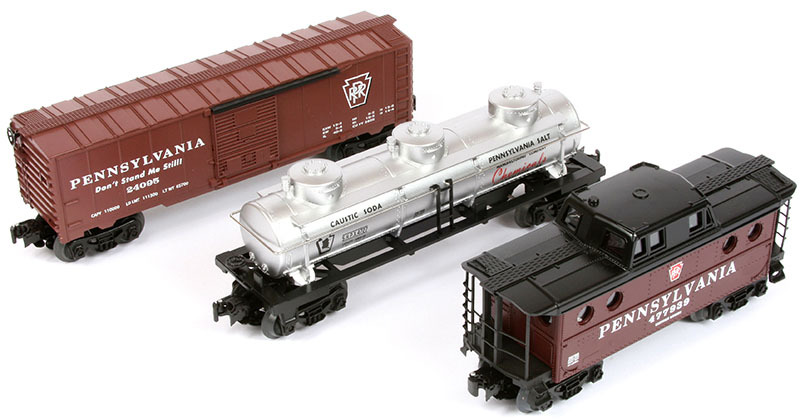 In addition, the Pennsy lettered boxcar is equipped with sliding side doors and separately applied brake wheel; the Pennsylvania Salt Manufacturing Company three-dome tank car displays add-on metal ladders and handrail, plus a plastic brake wheel; and the porthole-windowed Pennsy class N5C cabin, a true staple of the Lionel product line since the early 1950s, is outfitted with separate end platforms and ladders, brake wheels, and window glazing. All of the cars feature the same high quality of decoration as the motive power. Yet, model railroading is more than just appearances; it involves operation too and the included layout components are just as important for the first time model railroader. For those of us who had our upbringing with Lionel, you will be happy to know that gone are the days of the old tubular-style 3-rail track with its sharp edged black metal ties; Lionel’s FasTrack system is the wave of the future for O gauge. FasTrack features a plastic roadbed with simulated ballast and wooden ties, steel rails, and snap connection assembly; this track system is ideal for “Carpet Central” layouts and other temporary pikes. Forming a 40-inch by 60-inch oval and included in the Flyer set are eight O-36 curves, two standard 10-inch straight sections, a straight with power terminal, and a Plug-Expand-Play power lock-on straight section, which is ready for the future addition of a separately sold Lionel Plug-Expand-Play accessory. The manufacturer also produces a wide range of other FasTrack sections, such as turnouts and crossings, for future expansion. As found in the well written and illustrated set owner’s manual, assembly of the layout continues with the installation of three AAA size batteries (not included) into the rear of the LionChief controller; plugging the 54 volt-amp direct current (DC) wall-pack power supply into the electrical outlet; and, lastly, pushing the power supply’s audio style jack into the terminal track section. With the consist already assembled on the track, add the recommended four drops of the included smoke fluid into the stack of the engine, toggle the on/off switch found on the side of the remote control to the on position, and the junior engineer is ready to high ball! Advancing the throttle, the sound of steam brings the Pennsylvania Flyer to life with the chuff of the engine nicely in sync with the puff of smoke exiting the stack. Press the appropriate button on the LionChief unit for sounding the bell, as you move out of the yard and give the other signal button a press to hear the shrill of the whistle, which continues to sound as long as the button is held down. The centrally located announcement button provides up to six different recordings of radio chatter between the crew and the dispatcher in the yard tower based on time duration and whether the locomotive is sitting idle or in motion. The announcements, like “hey there, what are you waiting for, let’s roll” when the train is just sitting still for a lengthy period, is, admittedly, rather cheesy sounding to the experienced modeler, but, hey, the youngest of engineers will love it no less. The can motor equipped all-wheel drive locomotive in RMC’s sample set had plenty of get-up and go and, thanks to its heavy weight and traction-tire enhanced drivers, should be able to handle several additional O-gauge cars with ease. The train was very responsive to the LionChief controller and operation all-in-all was smooth and without anomaly; the puffing smoke unit was an especially convincing effect, as was the bright LED illuminated headlight. If the voluminous amounts of smoke becomes too much, or the constant sound of chuffing grows old, fear not, as there are separate on/off switches controlling these two features located beneath the cab of the engine. Keep in mind that the LionChief 0-8-0 can only be controlled by its accompanying remote control. In fact, dissimilar LionChief equipped locomotives, such as a diesel and a steam locomotive, for example, could be operated together on the same layout, as each will respond to their respective controllers on a different frequency band. Furthermore, while the included power pack operates on 18-volts DC, the locomotive will also function on traditional O-gauge alternating current (AC) power packs. Just make sure the throttle is set to 18 volts – the LionChief’s optimal operating voltage. Note, that the LionChief-equipped locomotive will not respond to a standard transformer’s throttle, bell, or horn controls, however. 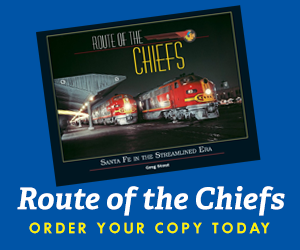 For an added attention getter regarding the tech generation and for even greater operational diversity, Lionel invites smartphone users to download its free LionChief app. 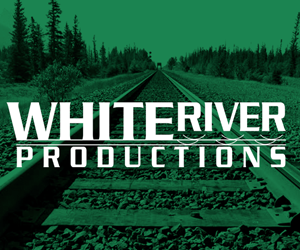 Compatible with LionChief and LionChief Plus (also outfitted with remote control couplers) locomotives, the new app will automatically recognize individual Bluetooth equipped locomotives on the layout and allow their control, albeit one at a time, from a single device. I also gave this feature a test drive and downloaded the app to my Apple iPhone. With the track voltage on, the LionChief app identified the set’s 0-8-0 sample immediately and offered excellent control of the locomotive, which rivaled that of the handheld remote, although I did find the touchscreen interface to be more appealing personally. In fact, there are additional settings to manipulate through this app, as well via the “Volume” and “Settings” buttons. Selecting the Volume button sends the operator to a new screen where they can adjust both the individual sound effects, as well as the overall volume of the audio; while the Settings screen provides access to the smoke unit’s on/off button, momentum selection of low, medium or high, and a maximum speed limit adjustment. This is a cool bonus that will further entice the participation of any youngster adept in smartphone technology. O gauge, in general, is still one of the best size trains with which to introduce a potential rookie to model railroading. Both the size and rugged qualities of these traditional trains and tracks lend themselves well to the youngest of potential rail barons while, admittedly, the tech incorporated into the newest 3-rail starter sets provide an appealing multi-sensory experience to which the latest generation has already become so accustomed. I guess you could say we trying to grow the hobby through the smartphone and Lionel appears to be accomplishing this feat with great success, as is evident from the looks of its Pennsylvania Flyer LionChief 0-8-0 Freight Set (#6-83984).